Once upon a time, in this same galaxy and not far away, there was a period when the world had no internet, there were no mobile devices, no smartphones (not even not-so-smart-phones), no tablets, no PSP, nothing of the sort… Yes, that was possible and it did happen, although today hardly anyone can recall what that was like. The Internet and the ‘connecting people’ technology has taken over our lives to such an extent that now it is impossible to imagine a world without them. But have you ever considered the impact that this new technology has on language? The very onset of the Internet itself sowed the seeds of a chat language that would soon branch out across all spectrums and propagate the already numerous cut-down words. Abbreviations and acronyms are used so commonly in everyday language, that sometimes you don’t even realize that you are using them. For example, e.g. and etc. are two of the most commonly used acronyms; as are SOS, ASAP, RSVP, AKA; or even things we see daily all around us: Ave., Str., Blvd. There are also the political ones: EU, USA, NATO, ECB, IMF, ESM, NAFTA, ASEAN, Mercosur, are a few examples. Then there is the computer language of jpegs, mp3s, pdfs, docs and all those types. And don’t forget to use cc. and bcc. when sending emails – although not literally carbon copies, they are still important! 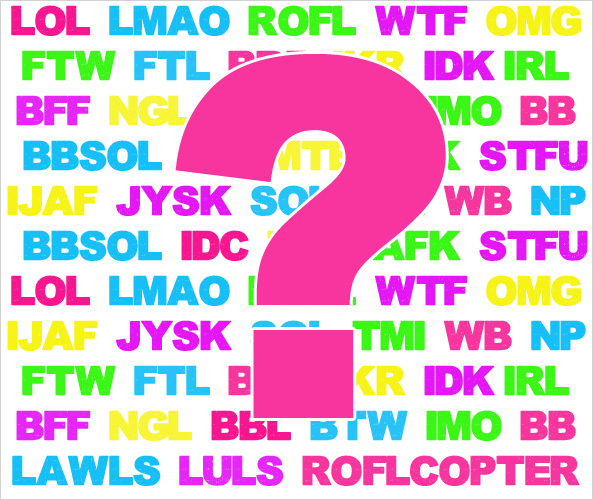 Internet acronyms (or slang) proliferate by the day. From the ‘oldies’ BRB, FYI, TLC (not to be confused with the BLT meal), THX, OMG, WTF, ICT, etc., there are a range of others sprouting all over the web, that sometimes you need to actually Google them to understand what they mean. BFF is the celebrity and girlish favourite, while LOL has so many variations it’s not even ROTFL funny! GR8 and L8R show how you can also introduce numbers to your speech, while IMHO (in my honest/humble opinion) is the variation of TBH (to be honest). Then there’s the frat (see? = Fraternity) favourite – BYOB – which can be widely interpreted as Bring Your Own Bed, or Bring Your Own Booze, depending on what kind of party you’re going to. There are even some acronyms that take longer to write than if you spelt out the entire phrase in the first place: MIL-TFD-41 seems like a space formula, PMFJI for some reason springs a set of pyjamas to mind, while TANSTAAFL seems too much work simply to spell out that There Ain’t No Such Thing As A Free Lunch. All in all, we are bombarded by all these short-hand versions of words and phrases that are supposed to shorten the time needed to communicate the message, but sometimes that very msg is lost not in translation, but in comprehension – the time gained typing it is actually spent double in searching what it really means! So you see the Internet has created a new language. But we need to keep up with it, if we too are to evolve alongside it. Even businesses have caught up with this trend now – do you know the difference between B2B and BforB for example? * If I Tell You What This Means Will You Buy Me A Drink?